Ladies – here’s another “Get To The Point Car Review”, I know most of you don’t want to hear the technical information. You just want to know do I want this vehicle. So check out the 2007 Audi Q7. 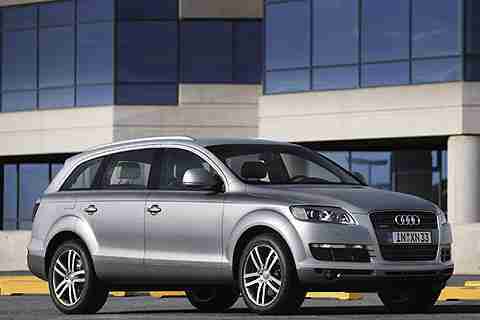 The Audi Q7 is a luxury crossover SUV that can seat up to seven passengers. For now, there are two styles available: base and Premium versions. Standard features include 18-inch wheels, adaptive bi-HID headlights (they turn when you turn-very cool), a power rear liftgate, automatic dual-zone climate control (everyone can have the temperature they prefer) , Audi’s Multi Media control interface (one dial controls it all) and a Bose audio system with an in-dash six-CD player. Leather upholstery, three rows of seating with a second-row bench, power front seats and a memory function for the driver seat are also included. The Premium package adds 19-inch wheels, a navigation system, park assist with a rearview camera (very cool system that shows you where you are going when in reverse), a large three-panel sunroof, heated front and rear seats, second-row captains’ chairs, an additional rear air conditioning unit and Sirius satellite radio. Most of these options listed can also be ordered individually on the base Q7. Other standalone options include an air suspension system (this is great for adjusting the ride height for different purposes), 20-inch wheels, advanced adaptive cruise control (this is perfect for knowing when a car is hiding in your blind spots – which happens more often than you may think) and an S-line exterior styling package (this is a sporty exterior package). The Q7 is available in 10 colors that are very elegant. There are so many unique items on the Q7 you would think they spoke with working Mom’s to get our input. The inly thing missing is a place for your purse – but we all deal with that everyday. The drive is adjustable comfort to sporty to off-road. I have to say, that after spending the day with the 2007 Audi Q7, this sporty SUV can fit any families needs. The price is reasonable too. The 2007 Q7 starts at $49,000. Stop by your local Audi dealer and take it for a spin, you’ll want to leave your minivan or SUV in the used car lot.